CEH's new Science Strategy identifies three interdependent, major societal and environmental challenges: Securing the Value of Nature, Building Resilience to Environmental Hazards, and Managing Environmental Change. We're delivering our strategy by Science Areas and underpinning activities, and over the next few weeks we are profiling each of these on our blog. 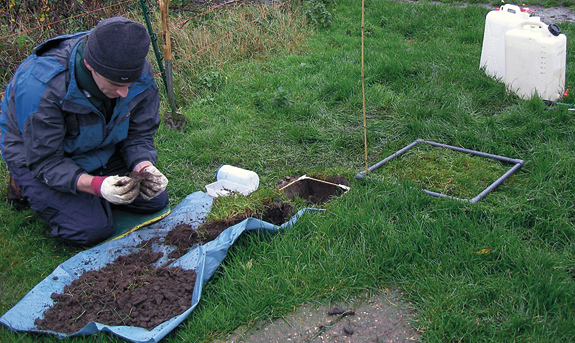 This post focuses on our Soil Science Area, which is led by Professor Bridget Emmett. Sound scientific knowledge of soil functioning is essential to assure UK and global security for food, fuel and water. The multidisciplinary research at CEH makes us ideally placed to develop new understanding of soil function and the relative importance of soil biota, physical and chemical properties and their emergent properties across scales. We apply this knowledge for improved sustainable management of soil and the ecosystem services soils provide. Soils are critical for life. As well as providing nutrients and water to grow food, they help regulate floods and droughts, they play an important role in modulating the greenhouse gases which control our climate, and they support a large and diverse biological community. But such societal benefits depend crucially on soil quantity and condition, both of which are at risk from threats such as over-exploitation, contamination and climate change. Understanding and managing the diverse and sometimes conflicting services provided by soils demands an integrated, multidisciplinary approach. CEH's current and future research objectives include new tools and data, for example we are developing in partnership a UK Soils Observatory and an enhanced mySoil app. We are aiming to increase understanding, for example of the links between biological and physical structure of upland soils and their implications for water and carbon services. We will quantify the impacts of land use change to energy crops on soil carbon stocks and greenhouse gas emissions for the UK, and we are developing web interfaces with partners to deliver real-time soil sensor data. For more details of these and other research objectives in our Soil Science Area, please see our Science Area Summary [PDF].